* June 10: Humidity Skate shop. New Orleans, LA. Signing at DIY spot: 6pm. * June 11: Faith Skate shop. Birmingham, AL. Demo: 6pm. * June 12: Sixth Ave Skatepark. Nashville, TN. Demo: 5pm. * June 15: Home Skate shop. Louisville, KY. Demo at Louisville Park: 2pm. * June 17: Cosmic Cincinnati. Cincinnati, OH. Signing: 1pm. * June 18: Westside Skates. Lakewood, OH. Demo: 4pm. 100 artists, including Emerica pros Ed Templeton and Jerry Hsu will be creating/donating skateboards to be sold at the Good Wood Exhibition skateboard deck art online auction-the first in a series of events benefiting RideIt Sculpture Park. The auction began May 19 and the final bid date will coincide with the art show on May 26 at 10-22-9 in Hamtramck, MI. 100% of funds raised will go to the initial RideIt Sculpture Park build beginning early June. For more info visit GoodWoodExhibit.com. On June 21, Emerica’s Wild in the Streets in Detroit will also raise awareness and funds for successive phases of RideIt Sculpture Park construction. Events will culminate at an Emerica/Thrasher Magazine fundraising party on the evening of June 21. 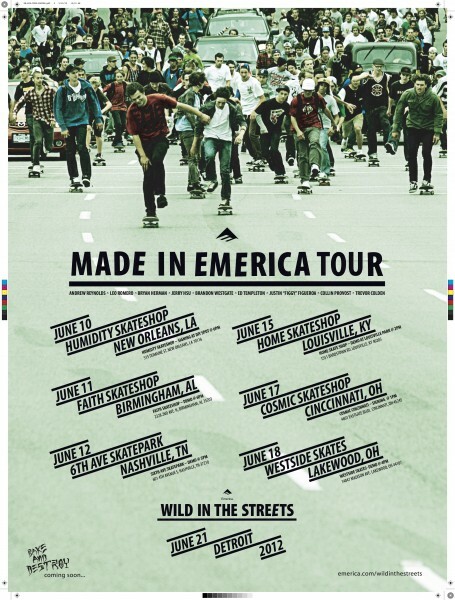 For complete #WITS updates and info, visit Emerica.com/wildinthestreets.